This is our Spruce Moose pool table. 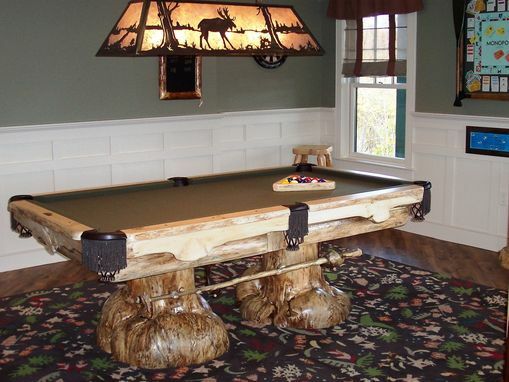 Native New England spruce burls are the dominant feature of this table series. Mother Nature has graciously provided us with these anomalies, which we have integrated into some eye-popping table designs. Every table is, indeed, one of a kind. Game tables that are also works of art. 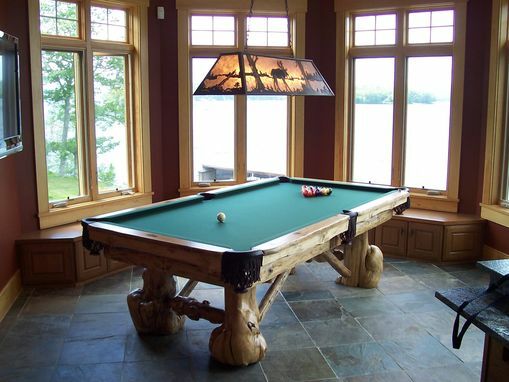 All of our pool tables utilize 1" slate and Accu-fast cushions, which allows us to offer a true lifetime warranty on every table we build. You get to choose the cloth color for your table, as well as deciding what types of accessories you wish to go with it. We have the ability to craft you matching rustic triangles, wall racks and bridge sticks!